I had a bit of time and the water levels looked good on the Connecticut River so I took a quick trip today. The report that I got from a quick search on the internet in regards to water level of the downstream dam was that water was flowing out of holding at a rate of 10,200 cfs until 1pm then slowing to 1,300 cfs till 6pm. We haven’t gotten any good reports from these spots lately so I was hesitant but had to try with such a nice day! The spot that I was planning on fishing today is rather shallow so I knew that I needed water in order for it to be productive. When I got there, the water was already at the base of the reeds so I bypassed it and headed to the next potential spot. The water here looked much better being that there is a good deep channel at all times. I fished up and down the setback and only was able to locate fish at one sheltered and channelized end. Being that I was on the river, I was limited on my tackle options. I was fishing Bentley tungsten under a bobber tipped with a chartreuse and red flake Bobby Garland. I began fishing at a depth of 3′ and after a slow start I adjusted my depth just 4.5′. I changed the depth of my bobber for two reasons: 1) I wasn’t catching many fish and 2) the current had my bait swimming just below the water level because it was moving so fast. It was comical how fast my bait was moving when fished close to shore in the current. About the time I changed my depth the water level stopped dropping rapidly. Noticeably, my casts were lasting much longer before being pushed to shore by the current. Because I was now fishing deeper in the water column and my jig was moving slower I was able to really work each cast the way I wanted to. 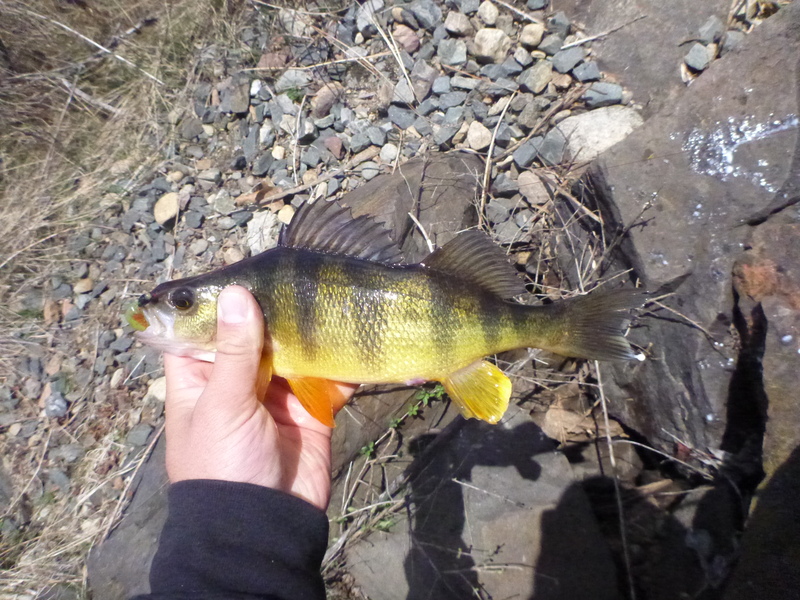 The first few casts in the new conditions produced some real nice perch. In the next 45 minutes I landed about 35 perch between 9-12″. They were all males as evidenced by the presence of milt. It was fun catching these fish as they were aggressive biting but slow to pull the bobber under. Their bites resembled crappies so much that each fish got me excited for its reveal! I am positive that I rolled at least one flat fish today because I was able to see the fish as soon as I set the hook. The semi-clear and low water level made it so the silhouettes only took a second to appear and one was a big round oval. Maybe next time I will know better! I was limited as to what parts of the setback I could fish today because I didn’t have my boat or kayak. I could see fish on the far shore popping at the surface for part of the time I was there, mainly when the water flow slowed. I would imagine they were crappie because of the distinct sound they were making. All in all it was a good mid day trip and I will be back there soon!